Goat yoga. What? Yep, you heard (or herd) that right. Goat yoga. It’s a real thing and it’s totally taking off for our newest client, Have Ya Herd in Roberts, WI. The back story of this business is my favorite part of it all. The Lubich family had purchased several, what the anticipated would be dairy goats and later found out it wasn’t going to work of well with the creamery and the goat milk. However, by the time this development came to light, the Lubich’s and their three young children had already fallen in love with their goat babies. So, what’s a family to do? Get rid of the kids? Of course not! Their quick thinking and SnapChat/social media loving Grandpa suggested they Google goat yoga. As, Jessica Lubich, founder says, “ok, I’ll Google it one time and that’s it.” It turns out Grandpa Paul was on to something. As a marketer, it’s so fun to see what new ideas are going to walk in the door. This idea had both Tarah and I excited from the start. Goat yoga might not be for everyone, but for two gals who love animals (especially cute ones) we knew this would be a project we’d love. Jessica had contacted us to help create the right brand and create a buzz about her new business. We did just that. 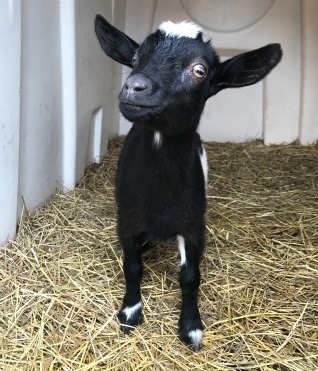 After hearing her story and meeting the goat staff, Harry Houdini the Nigerian Dwarf goat became our mascot, inspiration, and the model for the visual brand. See the original photo of Harry that launched the brand at the right. The sketch that would next become the logo in the lower right. The first steps in launching goat yoga was defining the most likely target market for the concept. Women, ages 25+, interested in animals and yoga. That’s our market. Armed with that information we launched on Facebook with boosted posts. That was how Mary Maguire from WCCO found this awesome business that is off the beaten track just over the border in Wisconsin. Concept + brand + targeting. That is why goat yoga in Roberts, WI is taking off. Meet the goats and schedule a class at haveyaherd.biz! You may also see the WCCO interview here.